Weddings seem to come in waves. Suddenly you notice there are a few big dates on the calendar, and you need a gift for each one! You want to veer off the registry and find special wedding gifts that make an impact. (Psst, that’s fine just take a peek at the registry first to get a better sense of the couple’s style.) Here’s your essential shopping guide to wedding gifts. Let the wedding season begin! 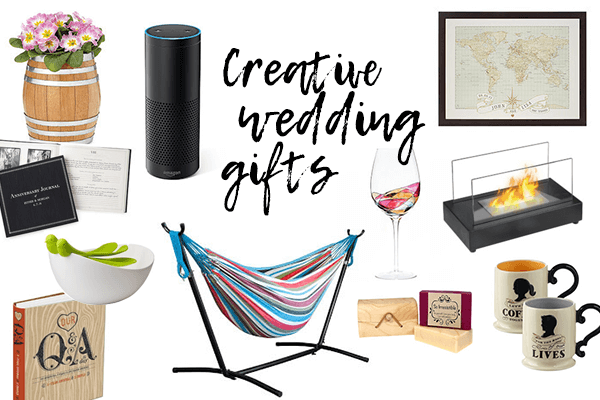 You want to fête your darling bride-and-groom-to-be with a wedding gift for the big day, and beyond - but that bridal registry looks totally picked over. How do you find the right wedding gift? There are the practical gifts that every couple needs, and then there are the covetable gifts guaranteed to be right up her alley. Choose a traditional or non-traditional wedding gift she'll love to receive (and don't forget to wrap it up with ribbons!). Give a wedding gift that delivers an upgrade on home essentials. Look for oh-so-special bed linens, matching aprons, or even a fun doormat to welcome the happy couple home. Give the couple a night off from cooking, for when it's back to reality after the honeymoon. Beyond a gift card, you could give a pizza of the month or dessert club as an unexpected treat. If everything left on the registry looks out of budget for you, choose a sentimental wedding gift. You can frame the wedding invitation or pick a personalized gift centered on their name, wedding date, or a photo of the couple. Choose a wedding gift that's perfect for the honeymoon - like a pretty set of pajamas, stylish dopp kit, or fun camera for taking selfies. Think about what the couple cares about. If it's the environment, find a top-of-the-line composter. If the pair loves to entertain, give a handy drink dispenser for serving a signature drink at the next party. The classic monogram is still a win for any wedding gift. From blankets to glassware, stamp those initials on an accent for their home. One-of-a-kind art and unique gifts are risky choices if you don't know the couple well. But if this is your BFF, you can unabashedly go for it. Just be sure to choose a wedding gift that's about her likes, not yours.